Edvard Munch was one of the forefathers of the Expressionist movement. He was born in 1863 in the Norwegian village of Ådalsbruk, around 120km north of Oslo. His father, a medical officer, moved the family to the city of Kristiania (now Oslo) a year later. Munch’s childhood was marked by tragedy: he lost his mother when he was five years old and his elder sister Sophie when he was 13 (both to tuberculosis). Personal suffering and struggles infused the art across his career — so much so, he claimed, that without them he’d ‘have been like a ship without a rudder’. Today, Munch is best known for his paintings — above all, that icon of psychological anguish, The Scream — but also other works from his ‘Frieze of Life’ cycle (which explored archetypal themes of love, loss, angst and death). These include Ashes, Madonna, and The Sick Child, depicting Sophie on her deathbed. As a major, new exhibition at the British Museum reveals, however, Munch was also a prolific maker of prints. He produced 850 printed compositions — and as many as 30,000 impressions. Like many European cities in the 19th century, Kristiania witnessed a surge in population because of industrialisation, rising from 17,000 in 1801 to 230,000 a century later. Culturally speaking, however, it remained something of an outpost, prompting Munch to move to Berlin in 1892. He struggled early on, frequently going hungry and, for a short spell, homeless. A turning point came when a small show of his paintings (including The Sick Child) was shut down on grounds of unseemly subject matter. ‘It was open for just a week, and notoriety and fame swiftly followed,’ Bartrum explains. ‘That was a defining moment of his career, as members of Berlin's avant-garde now started to pay attention to his work’. His first attempts in the medium were etchings in 1894, followed by lithography in 1895 and woodcuts in 1896. Munch was undoubtedly a quick learner, though it helped that he collaborated with a number of first-rate Berlin printers, such as Alexander Liebmann and Otto Felsing. Munch commonly used the same subject matter for his prints as he did for his paintings, although never as an exercise in simple reproduction. He was fond of bold reworkings and variations, ‘pushing the boundaries of different graphic media’, says Bartrum. The Scream offers a fine example of this. 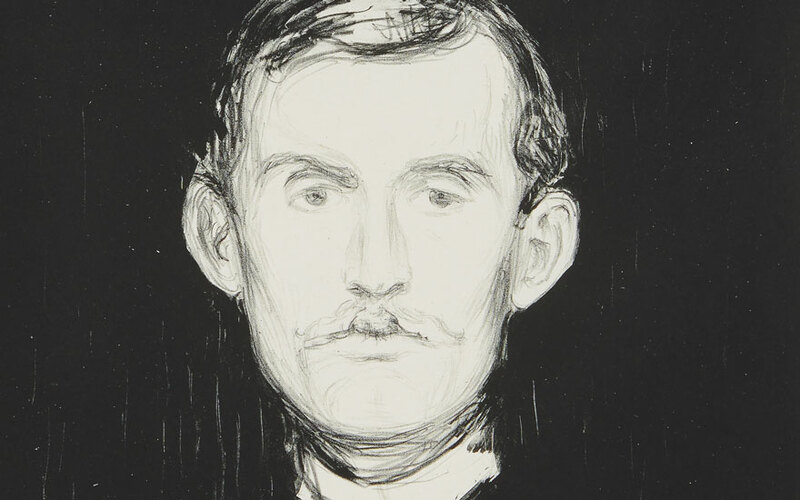 Munch’s original canvas dates to 1893, though in 1895 — with Liebmann’s assistance — he produced a set of black-and-white lithographs of the image. Around 20 survive, and one of them will be on show at the British Museum. Unlike the painting, the print comes with an inscription (in German) in the bottom right that reads, ‘I felt a large scream pass through nature’. The words reflect Munch’s explanation of his inspiration for The Scream: a walk on a hill above Kristiania, which was interrupted by a feeling of intense anguish as the setting sun turned red. It was actually thanks to the lithograph of The Scream — rather than the painting — that Munch’s fame spread internationally. In late 1895, it was reproduced in a Parisian arts journal, La Revue Blanche, and, according to Bartrum, ‘caused quite an impression’. Paris was then the capital of the art world, and people started wanting to find about more about Edvard Munch. Appetite for the artist’s work grew and grew thereafter. In the late 1890s Munch spent 18 months living in Paris. Once he started making prints, Munch continued to do so throughout his career. The British Museum’s focus is on arguably his two peak decades: the 1890s and 1900s (before he suffered an alcohol-related, nervous breakdown at the end of 1908). The show features what Bartrum considers ‘the most technically accomplished of all Munch’s prints’: Vampire II. Over the years, Munch made 10 different paintings and two sets of prints based on this image of a flame-haired woman biting her lover in the neck. Of the print versions, the first was made in black and white, the second in colour. What makes Vampire II so radical is the complex way Munch didn’t stick to just one technique, but combined two. He used lithographic stones (printed in black and red) as well as woodblocks (inked in blue, yellow and green). Munch never married and died childless in 1944, aged 80. He bequeathed the majority of his art to the city of Oslo (as Kristiania had been renamed in 1925), and today that bequest forms the core of the Munch Museum’s collection. Interestingly, the collection includes more than 500 matrices: the plates, stones and blocks with which he made his prints. A couple of these will be on show at the British Museum. Another of Munch’s printmaking innovations was his so-called ‘jigsaw’ method with woodcuts. This entailed sawing up a woodblock into shapes, inking those shapes in different colours, putting them back together, and then printing a multi-coloured image in one go. Moonlight I is among the works on show at the British Museum made in this fashion. The jigsaw method proved a lot quicker than the traditional way that colour woodcuts were printed, which required a separate block for each colour. One other area of Munch’s practice worth noting was his weathering of woodblocks in order to create a more textural grain (something clearly visible in a work such as The Kiss IV). The record price for a print by Munch at auction came in 2013, when his aquatint Young Woman on the Beach sold for £2.1 million ($3.2 million) at Christie’s London. In total, 23 of the artist’s prints have passed the $1 million mark. ‘It’s also helps the prints market that relatively few of Munch’s paintings come up for sale.’ (More than half of his canvases are part of the Munch Museum collection).